Low cost advertising in Newspaper. 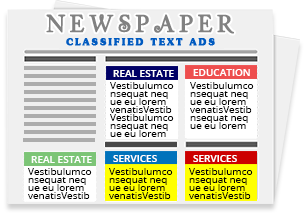 Running text Ad format in Classified section. Charged per Line/Word. Little Costlier than Classified Text Ads but more visible. Design your ad using Font/Logo/Images. Ad Rates are charged per sq.cm. The most Expensive form of newspaper advertising but with freedom to customize Ad Height & Width with Page Choice (Front / Back / Page 3) appearing beside editorial content. 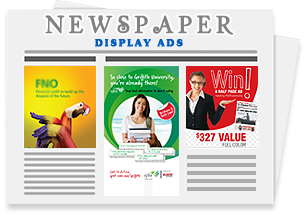 Bhaves Advertisers, an Authorized Advertising Agency to book Classified Ads Online for Newspapers in India. THROUGH ONLINE AD BOOKING SYSTEM! Book Ad Easily & Securely. Lowest Rates for Online Ad Booking.